Patio covers add value to your home while creating a more livable space for you to entertain or spend time with your family and friends. Not only will a patio cover help you enjoy your home and backyard more, it can save you money by keeping your home cooler in the summer while protecting you from the elements. At Pacific Home & Patio, we have many different patio cover styles to suit your individual needs. We custom design each of our patio covers to complement and enhance your home’s architectural design. Our architect can either design an attached patio cover for your home or build a freestanding one in another area of your yard. We offer glass patio covers, insulated patio covers, lattice patio covers, solid patio covers, and fabric patio covers. If you’re looking to impress, a glass patio cover may be right for you. Our high-end glass patio covers are the perfect solution to shelter you from Idaho’s unpredictable weather while letting in plenty of natural sunlight. Glass patios are not only beautiful, they can be designed in a variety of ways to make your outdoor area the perfect place to relax and recharge. Want to reclaim the use of your outdoor patio from the sun, wind, and rain? An insulated patio cover can reduce summer heat while providing excellent shelter from the harshest, outdoor elements. Custom designed to enhance the look of any home, insulated patios provide the ultimate protection to help you enjoy more of the outdoors without having to worry about the weather. Lattice patio covers are a great way to increase the use of your outdoor area. They can also greatly decrease the amount of money you spend cooling your home in the summertime. As a cost-effective way to add value to your home while reducing energy costs, lattice patio covers are a great choice for those looking for a little shade while letting the perfect amount of light shine through. 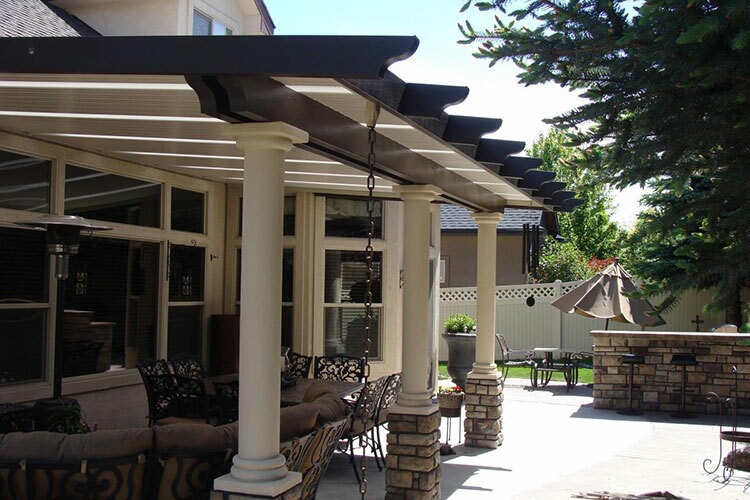 A solid patio cover is the best choice for those looking for maximum protection against Idaho’s harshest elements while enhancing the value of your home and reducing energy costs. As the perfect way to shade your outdoor area in almost any weather, a solid patio cover will provide you with reliable protection for many years to come.